Celebrations were held last week marking the 100th anniversary of the day on which the Representation of People Act was passed, giving women the vote for the first time (well, that who are aged over 30 and who occupied a house – or were married someone who did). 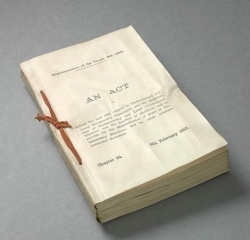 The bill, passed on 6th February, 1918, also extended voting rights to all men aged over 21 (previously it had been restricted to men who owned property) but it wasn’t until 10 years later than women gained the same right. A further bill was passed in November, 1918, which gave women the right to stand in elections. So when women first cast their votes in the next general election – held in December of that year – several women stood for seats in the House of Commons. In the end, only one – the Sinn Féin candidate for Dublin St Patrick’s, Constance Markievicz – was elected but she choose to sit in the Dáil Éireann in Dublin. This meant that the first woman to sit in the House of Commons didn’t do so until December, 1919, when Nancy Astor, elected as the MP for Plymouth Sutton, did so. Obnoxious voting limitations, as defined by age, gender and land ownership, did eventually end. But what a long time the process took 😦 I suppose The passing the Representation of People Act of 1918 was but a step en route to a true democracy.